Some time ago, we were asked whether we can provide a variable and robust CAD model for the TU Berlin TurboLab Stator test case. This stator is installed in a measurement rig at the TU Berlin (Germany), and it was designed on a representative stator geometry as used in modern jet engine compressors. This means that the design has been investigated quite a lot, and hence the performance of the stator is well known (e.g. pressure losses across different operating conditions). With a suitable and flexible CAD model, one is able to run optimizations on this case in order to reduce the pressure losses even further. Since this is an ideal and interesting application for CAESES®, we decided to create such a setup. Radii reduction limits for EWC. All these constraints need to be addressed in the CAD model, to be able to generate feasible design candidates during optimization runs. The final CAD model in CAESES® gets controlled by a set of parameters for the blade and for the EWC. Most of the parameters are linked to distribution functions for the section profile, such as camber or thickness, that are allowed to vary radiall direction. When generating new design candidates by changing the model parameters, most of the geometrical constraints are automatically fulfilled. For this purpose, we embedded internal optimization routines that take care of some of the constraints. For instance, the positions for the two inner holes (to fix the blade) get automatically optimized for each design in an internal loop. The following animations show quick changes to a set of parameters. The changes are rather large, just to give you an immediate idea of the the parameter effects. Note that the outlet angle is actually fixed in this benchmark test case i.e. you would not change the related parameters (however, our model contains this as an option, which is also visible in the animations). The first 3 animations show a single-parameter variation, while the last animation was created with 7 parameters. All animations were created within CAESES®. Note that CFD-based shape optimizations with this model can be carried out by using the optimization strategies from CAESES®, in combination with your simulation tool of choice. Alternatively, you can make use of your own optimization tools where CAESES® runs in batch mode to generate new geometries. 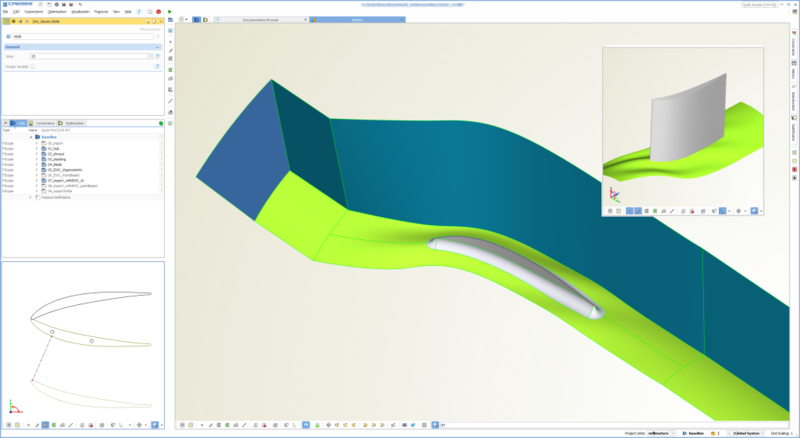 If you want to bring in your own ideas to this model, you can simply modify the blade and EWC parameterization – everything is open in our setup, and free to edit.